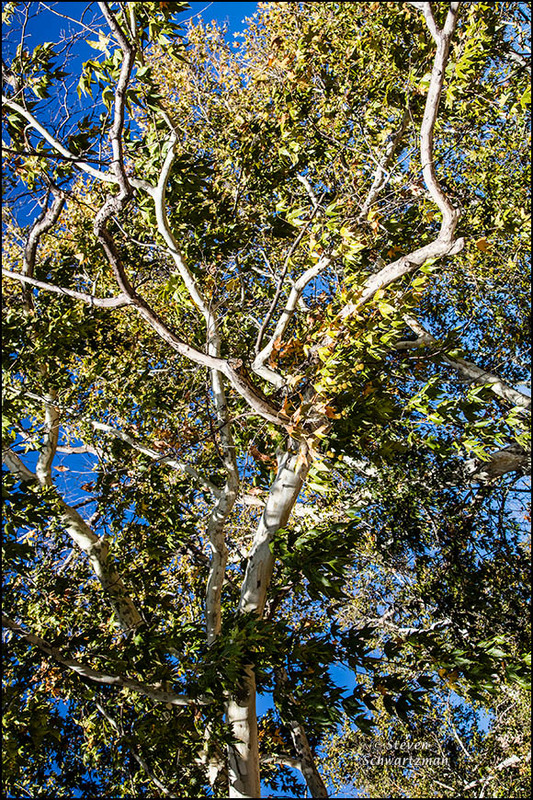 While visiting Montezuma Castle on October 18th last year I learned that there’s such a thing as an Arizona sycamore tree, Platanus wrightii. 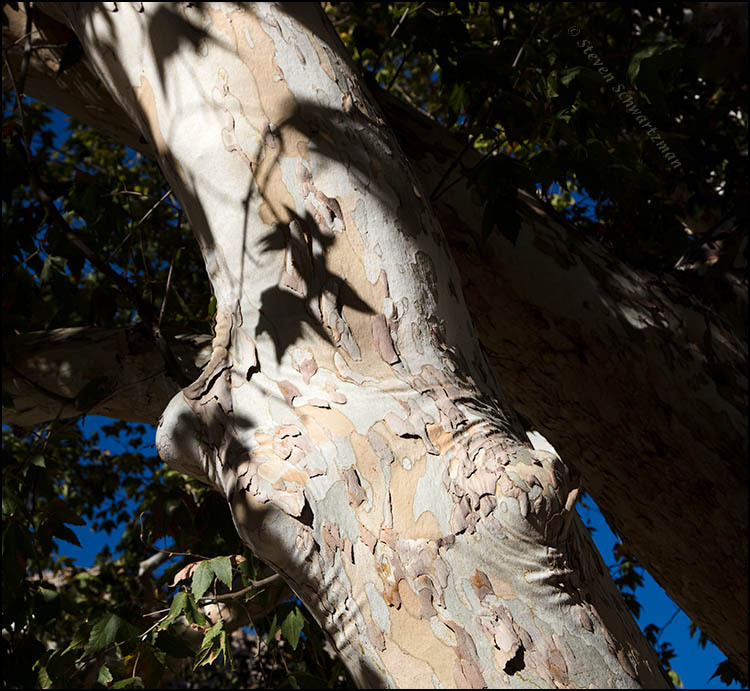 Like the better-known American sycamore, Platanus occidentalis, this one has bark that peels to reveal trunk and branches that shine white in the light of the sun, especially from a distance. A closer look, like the one below, reveals patterns and details. I’m still halfway around the world. You’re welcome to comment but I may be slow to reply. I’m sorry I also haven’t been able to keep up with your blogs. It was good to make the acquaintance of a new (to me) kind of sycamore. This looks like the tree growing in a little Arizona town we visit. When the vultures come back in the spring from Mexico, a dozen or more roost in the tree. You can see them circling as the day closes, then settling in on the branches. And in the morning you can catch them waiting for the thermals to lift them skyward. Neat birds. It probably is the same species of sycamore you’re familiar with from the roosting birds. I didn’t see any vultures on this one. Hm. I wonder if all sycamores smell delicious in the rain? It is one of my favorite smells in nature. I’ve never noticed the smell of wet sycamores but we have plenty of those trees in Austin so I’ll try to find out how they smell after a rain. Now you’ve got me intrigued. The closeup of the bark is delightful; the colors and textures are as appealing as they are a-peeling. I just discovered I have a nice photo of a Platanus occidentalis from the Tallgrass Prairie bottomlands, taken on October 24. It’s interesting to see the trees’ similarities and differences. Both are lovely in sunlight, that’s for sure. Sycamores are great trees, no question about it, and among our tallest. I never get tired of their bark patterns, and it seems they hold you in thrall as well. It’s good you discovered a picture you took of one on the tallgrass prairie, where it must have stood out. Yes, it is. Yesterday we made it all the way down to Bluff at the southern end of the South Island. We saw lots of luscious kelp at Stirling Point in Bluff. Have you gone that far south? Then you’ll have to follow in our footsteps.